Mooney on Theatre received with tremendous sorrow the news that one of our favourite venues–the Storefront Theatre–has been flooded. The auditorium itself has survived, but due to a popped water main, their offices, technical storage, computer equipment and everything else is now under 7 feet of water, mud and silt. The Storefront (and its resident company, Red One) has consistently been one of the most outstanding institutions in the Toronto theatre scene: every show (13 a year–which is an incredible number, even before factoring in festivals, one-nighters, etc.) which passes through their doors seems to be a success, and the venue itself is a particular gift to our community. If you can spare a few dollars, a fund has been established in support of rebuilding. But even if you can’t, we urge you–once it re-opens–to discover the Storefront, to enjoy its peculiar and unique delights, and to join us in cheering its return. Below the jump, the press release concerning this situation. Last night, The StoreFront Theatre — the venue where we performed SUCKER and ROCK and RedOne performed After Miss Julie — experienced a flood of epic proportions. A watermain just outside the venue exploded and dumped seven feet of water, mud and silt into the basement. Everything down there was destroyed (props, files, computers) and the current play, Shrewfrom RedOne, has been put on temporary hiatus. This is a not just major blow to our friends at The StoreFront Theatre, but one that affects the Toronto independent theatre community. The StoreFront has been a home to 13 full scale productions in just over a year. Without this venue, many incredible shows this year may have never been staged! But where there is struggle, there is strength. In the last 24 hours, actors, directors, stage managers, technicians, designers and other theatre companies have all come to The StoreFront Theatre to help with the clean up. Indie has united! If people would like to show your support in the restoration of The StoreFront Theatre, please consider making a donation to The StoreFront Theatre Flood Recovery Fund. Generators and shop vacs aren’t cheap, folks! Be advised that this release was altered slightly to remove industry information. 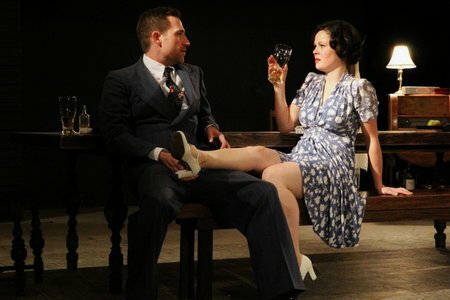 Production photo of After Miss Julie provided by Red One Theatre Collective.